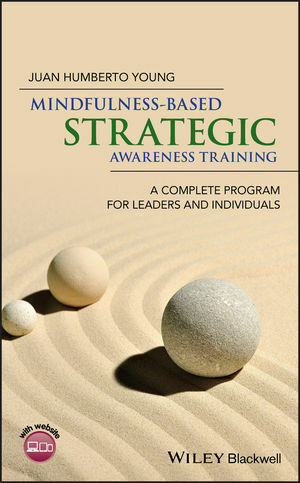 Mindfulness-Based Strategic Awareness Training: A Complete Program for Leaders and Individuals is the first book to link mindfulness training and positive psychology to the leadership, strategy and management issues faced by individuals and organizations. This book is important for all who seek to lead organizations, showing how mindfulness can be combined with the findings from positive psychology for the benefit of all. The book is not just good theory. It also provides a step-by-step practical program to cultivate a balance between motivation for outcomes on the one hand, and compassion toward self and others on the other. Here are skills that can be learned; skills that can truly inspire and sustain wise leadership. —Mark Williams, Emeritus Professor of Clinical Psychology, University of Oxford, was also the Founding Director of the Oxford Mindfulness Centre. Now Senior Research Fellow at the Department of Psychiatry of Oxford University. Author of "Mindfulness: An Eight week Plan for Finding Peace in a Frantic World", Co-author with Zindel V. Segal and John Teasdale of "Mindfulness-Based Cognitive Therapy for Depression". In today's disruptive times, it is happy and loyal customers that count. This rich and practical book provides an exceptionally smart learning tool to help consumers make mindful decisions that lead to happiness. And for any leader and manager it is a key reading for making wise business and marketing decisions that create value.—Bernd Schmitt, Ph.D., Professor, Columbia Business School, New York. Author of "Experiential Marketing: How to Get Consumers to Sense, Fell, Think and Act, Relate to your Company and Brands" and "Happy Customers Everywhere: How Your Business Can Profit from the Insights of Positive Psychology." Juan Humberto Young is the first to integrate positive psychology and mindfulness with a results-oriented focus on business strategy. In today's ever-changing organizations, leaders need clarity and flexibility to adapt and succeed. Built on leading-edge science, this book offers a step-by-step program that will light your path not only to greater strategic awareness but also to greater well-being.—Barbara L. Fredrickson, Ph.D., Kenan, Distinguished Professor of Psychology and Neuroscience, University of North Carolina at Chapel Hill. Author of the two bestsellers "Positivity: Top-Notch Research Reveals the Upward Spiral That Will Change Your Life" and "Love 2.0: Finding Happiness and Health in Moments of Connection". Juan Humberto Young integrates mindfulness practices, positive psychology, and extensive business experience to design a practical training program that improves personal and professional decision-making. This book offers tools to make decisions that increase subjective well-being because the sources of much unhappiness are poor decisions. For business leaders, lawyers, negotiators, and everyone who wants to improve their quality of life, this book presents a path to achieve the capacity of strategic awareness, consisting of mental lucidity, emotional clarity, and bodily awareness, which results in skillful decision-making. This book provides readers an ideal way to find happiness, personal balance, and professional success.—Peter H. Huang, J.D. Ph.D., Professor and DeMuth Chair of Business Law, University of Colorado Law School. Author of numerous articles integrating Positive Psychology, Mindfulness and Law. Juan Humberto Young is Professor of Positive Leadership, Strategy and Finance at IE University and Business School, Madrid. He is a recognized pioneer in designing and delivering services that apply mindfulness and positive psychology to management, and has more than forty years of experience in consulting and management including board and senior level management positions with UBS, KPMG anda Swiss Electro-Engineering firm. His academic credentials include a doctorate in Management from Case Western Reserve University, a Master of Applied Positive Psychology from the University of Pennsylvania, a Master of Mindfulness-based Cognitive Therapy from Oxford University and Masters degrees in Management including a MBA from the University of Chicago and Harvard. He is currently the owner of a positive strategy consultancy company and Academic Director of the Executive Master in Positive Leadership and Strategy at IE University, Madrid.